When you filter a list, you temporarily hide some of your content. 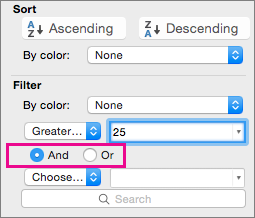 Filters provide a quick way to find and work with a subset of data in a range or table. Click a cell in the range or table that you want to filter. Under Filter, click Choose One, and then enter your filter criteria. You can apply filters to only one range of cells on a sheet at a time. When you apply a filter to a column, the only filters available for other columns are the values visible in the currently filtered range. Only the first 10,000 unique entries in a list appear in the filter window. In the box next to the pop-up menu, enter the number that you want to use. Instead of filtering, you can use conditional formatting to make the top or bottom numbers stand out clearly in your data. On the Data tab, click Filter . This option is available only if the column that you want to filter contains a blank cell. On the Data toolbar, click Filter. In the (Select All) area, scroll down and select the (Blanks) check box. Does Not Contain or Does Not Equal. In the box next to the pop-up menu, enter the text that you want to use. On the Data toolbar, click Filter . Wildcard characters can be used to help you build criteria. Under Filter, click Choose One, and select any option. In the text box, type your criteria and include a wildcard character. 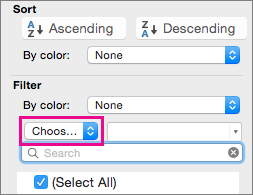 For example, if you wanted your filter to catch both the word "seat" and "seam", type sea?. For example, there~? finds "there?" Click the arrow in a column that includes a filter, and then click Clear Filter. Select the columns of the range or table that have filters applied, and then on the Data tab, click Filter. When you filter data, only the data that meets your criteria appears. The data that doesn't meet that criteria is hidden. After you filter data, you can copy, find, edit, format, chart, and print the subset of filtered data. Filters are additive. This means that each additional filter is based on the current filter and further reduces the subset of data. You can make complex filters by filtering on more than one value, more than one format, or more than one criteria. For example, you can filter on all numbers greater than 5 that are also below average. But some filters (top and bottom ten, above and below average) are based on the original range of cells. For example, when you filter the top ten values, you'll see the top ten values of the whole list, not the top ten values of the subset of the last filter. In Excel, you can create three kinds of filters: by values, by a format, or by criteria. But each of these filter types is mutually exclusive. For example, you can filter by cell color or by a list of numbers, but not by both. You can filter by icon or by a custom filter, but not by both. Filters hide extraneous data. In this manner, you can concentrate on just what you want to see. In contrast, when you sort data, the data is rearranged into some order. For more information about sorting, see Sort a list of data. You can filter by more than one column. When you apply a filter to a column, the only filters available for other columns are the values visible in the currently filtered range. Note: When you use Find to search filtered data, only the data that is displayed is searched; data that is not displayed is not searched. To search all the data, clear all filters. Top 10, click Items, and then on the pop-up menu, click Percent. Bottom 10, click Items, and then on the pop-up menu, click Percent. Instead of filtering, you can use conditional formatting to make the top or bottom numbers stand out clearly in your data. For more information about conditional formatting, see Highlight data points with conditional formatting. Greater Than or Less Than. Equals or Does Not Equal. Click the arrow in the column that contains the content that you want to filter, and then click Clear Filter. From the Data menu, click Clear Filters. Select the columns of the table that has filters applied, then from the Data menu, click Clear Filters.